Per longstanding tradition, we had a presidential election in 2004, and per longstanding tradition, there was debate about whether the Electoral College was a fair way to elect a president. Now, I’m not a political junkie so I make no claims of expertise in that area, however my intrigue with data and demographics hooked me into the debate. I have always been intrigued by the fact that residents in smaller states have a larger formal voting power in both the Electoral College and in the U.S. Senate. For example, each Senator in California represents roughly 18 million people, while each Senator in Alaska represents about 230,000 people. In an increasingly federalist nation, it sometimes furrows my brow. At the time, I was doing a lot of traveling for clients, so I had lots of down time on planes. Like any normal demographer, my mind wandered to that subject, and I had a whimsical thought. 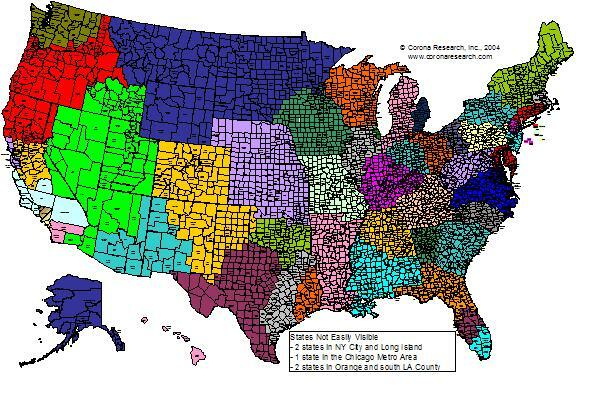 What if state boundaries changed after every census so that each state had the same population? That would make everyone’s representation equal in the Senate and in the Electoral College. Cool, eh? Now, I know that this would never happen. The social impact of redrawing borders would wreak havoc on many elements of our everyday lives. But it’s a fun thought so I decided to do some research. Instead of reading the in-flight magazine on my flights, I dug up data on a county level map and started redrawing state boundaries using the 2000 Census data. My strategy was that I would maintain current state boundaries where possible, that I would maintain cultural identities where possible, and that I would keep all new states’ populations within a range of roughly three percent of each other. The research was harder than it sounded, and it kept me busy on numerous flights to the east coast and back. But eventually I did it, and produced the map below. So what do you think? Would you enjoy living in your new state in this system? The results are fun to look at. First, you’ll see (or not see) that five states would be very small in size. New York City and Long Island would combine to form two states, and we would have two states in Orange County and south LA County. Part of the Chicago Metro Area would be a state too, so the three big metropolises would be 5 of our 50 states. Elsewhere, we would see Florida comprising most of three states and Texas splitting into five, while California as a whole would contain all or part of seven new states. Missouri would survive nearly unchanged, adopting a few counties in rural Arkansas to comb down that bootheel cowlick in its southeast corner, and Kansas and Nebraska would neatly combine into one state with a little imperialism to the south. One of my hardest parts of the evaluation was figuring out what to do with the Minneapolis/St. Paul metro area. Its population didn’t seem to work well in any configuration, and I eventually resignedly split them, brother against brother. The central cities and northern suburbs joined the large northern state of North WyMonAlaskakota, and the rest of the suburbs formed the northern border of Iowasota. Hopefully that won’t cause civil strife. There are a few other minor hitches, but nothing insurmountable. Dallas residents might initially resist living in Oklahoma and becoming Sooners fans, but they’ll adjust. Salt Lake City and Las Vegas might see some minor social and cultural clashes, but that’ll just make the governor’s election more interesting. And Hawaii residents may not enjoy flying to San Diego to pay their speeding tickets, but hey, that’s a small price to pay for living in Hawaii, am I right? On the other hand, it worked out so well for Wisconsin to absorb the Upper Peninsula of Michigan that it almost seemed like destiny. And who in Arkansas would argue against having a coastline? Some things are just meant to be. All it takes is an occasional change of in-state tuition for college students and some havoc with the post office, and your reward is an attractive and ever-changing map, and a guarantee of equal representation in this great nation of ours.